We are holding an Open Rehearsal on 25th July at 7.30pm, doors open and refreshments will be available from 7pm at Whitchurch Methodist Church, Cardiff. Come along and support us and hear what kind of music we are working on at present, admission is free, but donations are welcome towards our group’s fundraising. 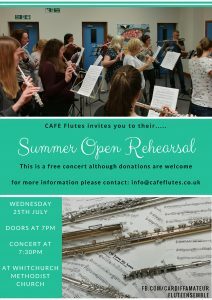 For more information email info@cafeflutes.co.uk.